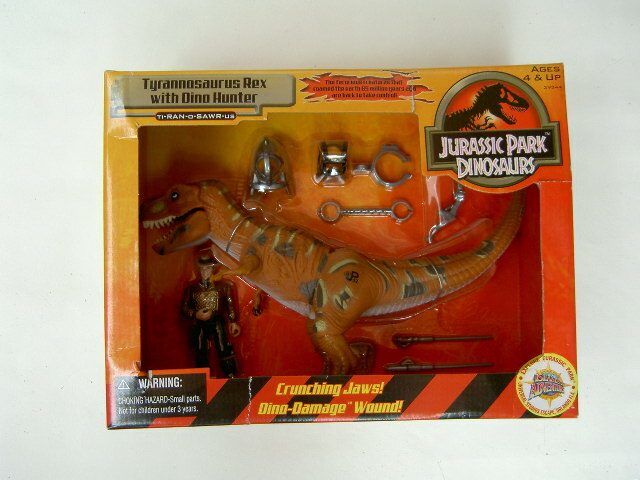 Description: this repainted Young T-Rex figure is a recast of its JPS1 counterpart, comprised of much harder and less flexible material than its predecessor. At first glance it looks like an otherwise unchanged sculpt though. It stands in the same fully neutral posture, and still includes dino damage: on its right flank a piece of skin can be removed, revealing a dino damage wound underneath, showing white ribs and red muscle tissue. The wound patch itself is largely symmetrical in shape. The Rex’s small two fingered arms are its only poseable body parts. The Tyrannosaur's paint job also looks a lot like the one from the original figure. Except for the underside (throat, belly, lowest part of the tail) which is painted white, the whole figure is coloured light brown. It features various shapes of dark grey surrounded by beige edges on various parts of its body, most notably on the tail and upper legs. Additional grey and beige stripes are found on the creature's neck and torso, while spots of both colours are located on its head. The figure has black eye sockets with white eyes (and black pupils), while the inside of the mouth, including the tongue, is painted red and sports white teeth. The claws on both hands and feet are black; it has a line of dark spots running down over each toe (so three lines on each foot). On its left upper leg, the figure is marked with a black JP logo, along with the number .22 and a small Site B logo. This is very odd, since none of the other JPD1 dinosaur figures carry these extra markings: the Site B logo was only reserved for TLW figures, and the numerical system for the Kenner system already had the JPS2 Utahraptor marked as .22. Three pieces of capture gear come with the T-Rex. There's the required tag, which comes with many dinosaur figures and is quite big in this case: it fits well around the creature's neck. It also comes with a leg restraint, which can hold on to both legs simultaneously. Lastly, there is a big muzzle which can go around the figure's jaws, effectively disabling them, while also covering the eyes, so the Rex can't see what's going on. All three pieces are coloured in the same shiny metallic grey paint job. The Dino Hunter stands in a somewhat unusual pose, with his left arm held back and his right arm held close to his chest. The position of the arms facilitates him holding his bow. His left leg is posed in a forward move and his right leg backwards, as if bracing himself while using his weapon. He wears a brown jacket with golden “armour” like highlights on his arms and chest. On his left upper arm he sports a JP T-Rex badge (the black Rex skull and arms in a yellow circle, most famously being part of the classic JP logo). Additionally, he wears green trousers, adorned with a brown gun holster on his right hip and a grey knife holster with a brown knife handle sticking out on his left lower leg. He has black boots, and wears a tan cowboy hat with a green band on top and the right flap turned upwards, revealing a second JP T-Rex logo. He has brown hair, ending in a short pony tail, brown eyebrows and black eyes, and carries a rather smug facial expression. This Hunter comes with a bow and two arrows as his main action feature. The bow is a triangular, mechanical looking weapon (not the old-fashioned Robin Hood style wooden bow) with some protrusions sticking out, most notably a large tip up front and a rectangular plate right under this, sporting a handle on the left side so the hunter can hold it, and a little hole to “load” an arrow on the right side. A long transparent wire is used to launch arrows with: this wire runs over the bow in such a fashion that it appears there's actually three wires instead of one. The bow sports a silver paint job. Two different arrows come with it, a long one with a cone shaped tip and a shorter arrow with a flatter tip. Both arrows are metallic grey in colour and have a tiny incision at their ends so they can be loaded in the bow by sticking them through the small hole and pressing the incision around one of the strings. Pulling the string backwards thus launches the arrow. The figure also comes with a small black backpack for storing the arrows when not used. It's basically a hollow basket with straps on it so he can carry it on his back. Analysis: not only smaller classic dinosaur figures return for the first JP: Dinosaur toy line, it also witnesses the return of the dinosaur prince, the former Young T-Rex from the very first Jurassic Park line (though the 'young' part is left out this time, but it's still not the size of a fully grown T-Rex). The creature appears very similar to its iconic forefather, but things are not what they seem... This is not merely a repaint, it's actually a recast. The old flexible 'real feel' dino skin has been replaced with stronger and harder material. Unfortunately, this was a bad decision on the designers' part, since it mostly kills the 'crunching' action mentioned on its box, as well as the dino damage option. Pressing the neck to make the jaws open just doesn't work any more; in fact, the jaws can't really be opened much at all. It even has trouble clutching the Dino Hunter between its jaws. So there goes this dinosaur's only attack option... Which leaves us with its most vulnerable point, the dino damage wound. The wound piece is still there, in the same spot as before. However, because of the new material the figure is made of, it's very hard to remove the wound cover, and even harder to put it back. Remember the difficulties with removing the TLWS1 Pachycephalosaurus' wound piece? Same thing here, but even worse! This sadly doesn't leave the T-Rex with much, except for being a decently sized good looking figure. The paint job is also very similar to the one used on the old JPS1 Young T-Rex, which was also coloured light brown with a white underside and grey stripes and shapes on its back, but the additional beige colourations are new. Details like the inside of the mouth and the claws are not forgotten, while extra features like black eye sockets and spotted toes enhance it further. Still, it's not the best of paint jobs. It seems overly festive but dull at the same time, like confetti with all the happy bright colours removed. Overall, changes have been made to this T-Rex that shouldn't have been made, and the set suffers from it. That leaves the Dino Hunter to clean up the mess a bit. Former Sgt. T-Rex Turner (this time actually paired with a T-Rex!) has been demoted to random 'dino hunter', but at least his paint job doesn't look the worse from it. His new colour scheme actually is a nice change from his rather dull original paint job. The position of his arms is still a bit of a nuisance, but works well in combination with his bow and arrows. This weapon works as it did before: it takes some practice but it can actually launch arrows, though these would do little damage to the Tyrannosaurus (though as we have established above, Rex won't bite back much any more). The backpack still comes in handy for storing unused arrows. This figure may not be the most likely dino tracker to pair up with the T-Rex, but it's nice to see an actually complete JPS2 figure return for a change, instead of just Jaws Jackson's head stuck on a TLW figure. Repaint: yes. This is a repainted recast of the original JPS1 Young T-Rex (already repainted for JPS2 and as a TLW Exclusive), with repainted (and also recast) dino damage, and capture gear first seen on its JPS2 counterpart. The Dino Hunter is a JPS2 Sgt. T-Rex Turner repaint, with accessories from that same figure. Both figures would not be repainted again. Overall rating: 6/10. Though this Tyrannosaurus is still a good figure, its paint job is nothing special and the new material it's composed of effectively kills both the biting action and the ease with which the dino damage could previously be applied. The rest of the set is okay, though also not particularly appealing, but at least not with butchered action features. This set is not the easiest find of this toy line, especially in MIB or complete condition. It could take a while to track it down, plus a fair amount of cash to acquire it. You might very well find it to be unworthy of the effort.